Colour: White,Red, Pink,Green.Blue,Yellow. 3 sizes for different types of dog. The brightest and most robust light-up dog collar on the market, Keep a track on your dog in the dark with the brightest light-up dog collar on the market! Features include: fully weather resistant design, padded neck collar, robust buckle with o-ring and of course the high visibility external LED’s. Includes 2 x CR2032 batteries which last around 50 hours and are easily replaceable. 3 sizes for different types of dog. S: adjustable Collar 25-30cm, Width: 2cm. M:adjustable Collar 30-40cm, Width: 2cm. L: adjustable Collar 40-50cm, Width: 2cm. Keep a track on your dog in the dark with the brightest light-up dog collar on the market! 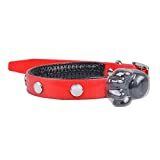 The multi functional dog collar has been designed with both comfort and visibility as the key features and we have to say they haven’t disappointed. The woven fabric is completely covered by a plastic coating which is both waterproof and flexible, and a robust padded neck grip has been added to ensure comfort in all situations. The included CR2032 batteries will last approximately 50 hours before they need replacing and the secure pooch paw attached to the collar ensures no water enters the battery compartment. The LED dog collar has been tested relentlessly against ‘pulling’ and in all weathers to ensure the collar is fit to last a life time! Note: Please allow color slightly differs from the picture due to the lighting. Please allow small error of measurement due to the manual measurement. 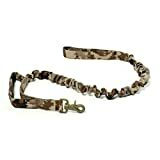 Dean & Tyler “SOFT TOUCH THIN” With Black Padding Dog Leash – Herm Sprenger Hardware And Ring On Handle – 91cm by 1cm Width – Tan.